This exciting trip encompasses the highlights of four countries on this classic route through Indochina. We travel overland through Cambodia visiting the temples of Angkor and Phnom Penh before continuing the adventure up through Vietnam by train and along scenic roads. Travel onto sleepy Luang Prabang, where we cruise along the Mekong from Laos onto the colourful hill tribe region of Northern Thailand. This morning we fly to Luang Prabang. The remainder of the day is free to enjoy this lovely riverside town at your own pace. Home to the impressive Thad Makmo stupa (Buddhist shrine) and the beautifully ornate Wat Xieng Thong, Luang Prabang has a wealth of architectural highlights that include both traditional Laotian style and French colonial buildings. Perhaps you would like to try your hand at Lao cooking or riding an elephant; or simply relax with a coffee or a Beer Lao in one of the riverside bars and watch the world go lazily by. We continue on our boat journey enjoying the landscape as we go. When we reach the Thai border at Chiang Khong we are met by a new tour leader. We drive around 3 hours to Chiang Rai in the far north of Thailand very close to both the Laos and Burmese borders, in the area known as The Golden Triangle. This evening we recommend a visit to the night market to discover some of Thailand's delicious street food. Today we make the 4 hour journey to Chiang Mai visiting Wat Rong Khun, otherwise known as The White Temple, along the way. This is an unusual and quirky Buddhist temple as it is was designed by a contemporary artist who began construction in 1998. On arrival in Chiang Mai the remainder of the day is left free to make your first impressions of the city. A torch, water bottle, insect repellent and high factor suncream are all essential, as are good quality sunglasses and a lip salve with sun protection. Don't forget your swim wear! An overnight bag is useful for the overnight trains/ bus. 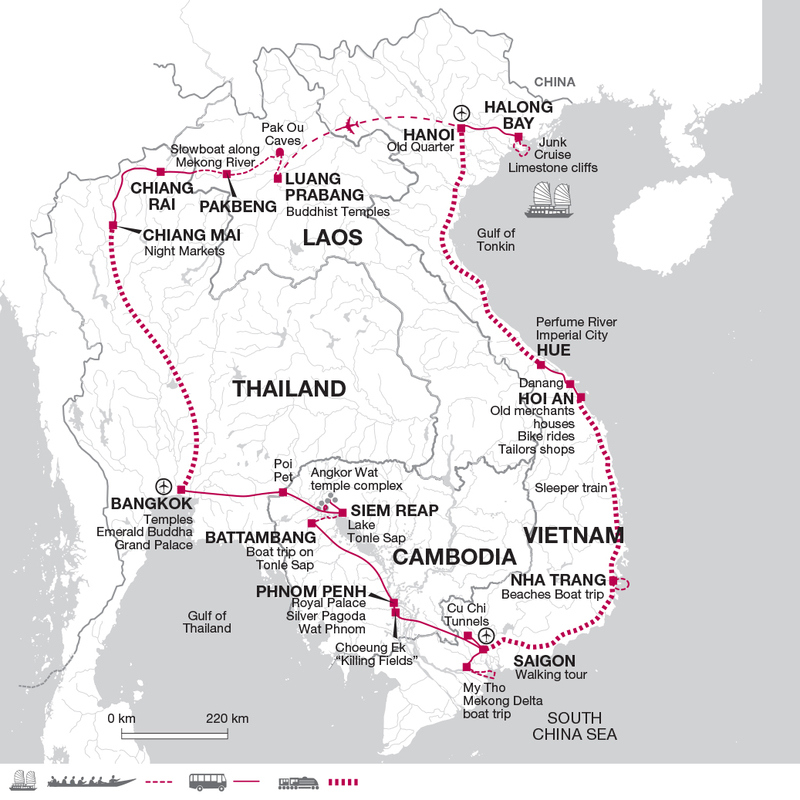 This classic journey through Indochina is a combination of three of our shorter tours: Indochina Explorer (QBK), Good Morning Vietnam (QVN) and Backroads from Hanoi to Bangkok (QLT). The trip has been planned using mainly public transport and travels overland as much as possible to give a real flavour of local travel. Plenty of free time is planned in to allow you to decide what to see and do in each destination, although we do offer optional excursions. This epic journey is for the more adventurous and is a great way to see the entire region.